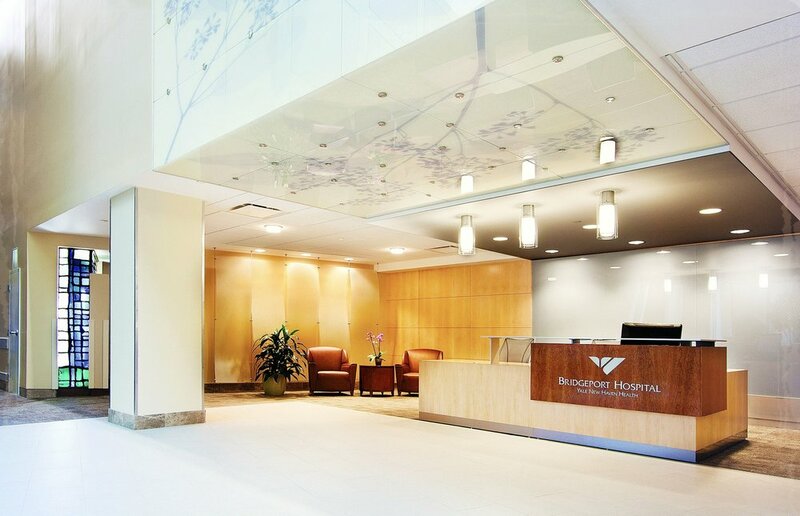 As a new member of the Yale New Haven Health System, Bridgeport Hospital facility improvements strive to reinforce a more cohesive system identity through enhanced, carefully branded interiors. CAMA has set the interior brand standards for YNHH for many years and this project was no exception as this lobby renovation offers a range of positive distractions, including retail amenities and places of respite for the time between medical interventions or visits, with seating options to accommodate a range of activities. For example, a water feature at the entry placed amidst a computer café helps segregate the hustle and bustle of a busy lobby from those seeking respite in an open environment. Improved circulation patterns provide clear and calming wayfinding cues to key first floor destinations and central elevators. The use of a variety of natural materials and an updated lighting scheme accentuate wayfinding landmarks. The new design encourages visitors to pause and gather information either intuitively or by interacting with a live greeter prior to navigating to final destinations deep within this large medical facility.